Renovated from two heritage shophouses on Calmette (171 Calmette, 1st floor), just south of the Ben Thanh traffic circle, Café-Restaurant revives the art of the Grand Café, a stylish place to unwind with a cup of coffee, with the well-executed menu of a European brasserie. The newly opened restaurant is a mix of modern and classic, both in décor and menu offerings. 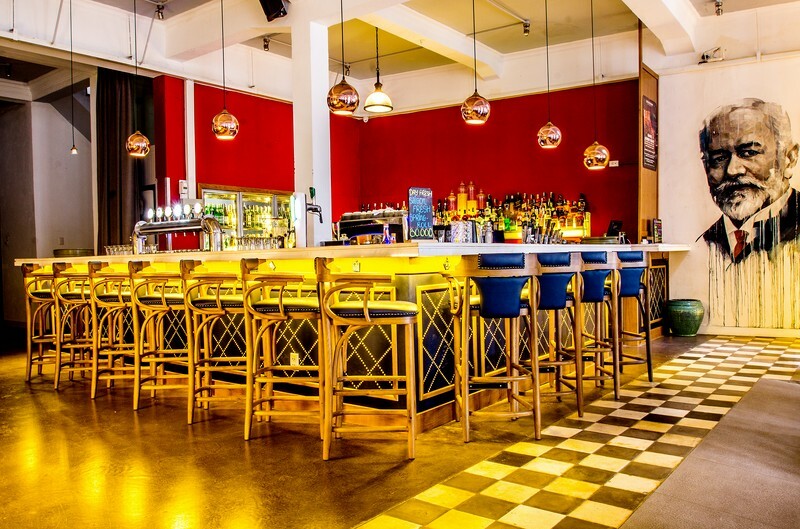 Century-old tiles meld into cool painted concrete floors in a large industrial-chic space accented by vintage mood lighting and studded seating, juxtaposed against a gleaming open kitchen all set to a backdrop of hip lounge music. The décor is a tasteful homage to Saigon itself ― a mosaic of Ben Thanh Market made from salvaged tiles adorns one wall while contemporary Asian art breaks up the clean white space, including a mural of Dr. Calmette himself, whose quirky experiments inspire a range of playful cocktails like the Poisonous Bloody Mary (VND220,000), a dangerous concoction of tomato juice, Platinum beer, Saigon Charlie’s Hot Sauce and a sliver of bacon. Patrons can take a seat around the open kitchen or the softly lit bar area, as well as at tables and sofas throughout the spacious open-plan restaurant. Our meal begins with Steve’s Octopus Salad (VND160,000), a creation of Executive Chef Steven Long who contributes his 12 years of culinary experience peppered with influence from time spent cooking in the Mediterranean. 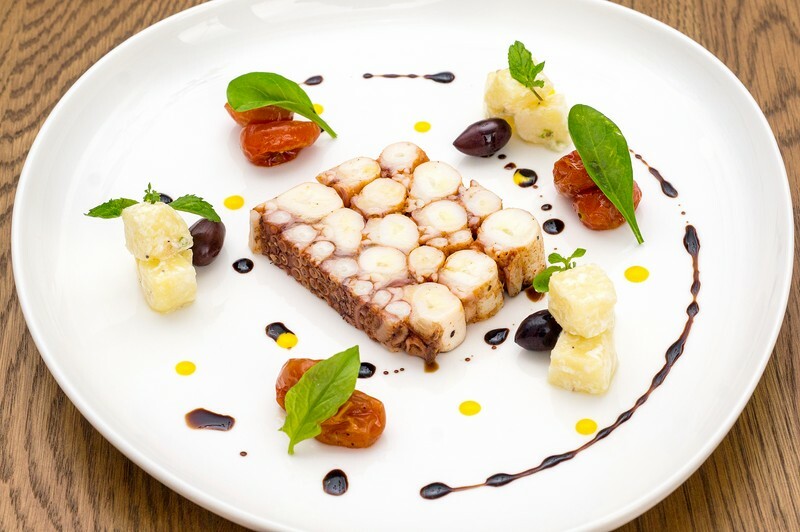 The star of this eclectic dish is a cold terrine of octopus, simply flavored with its own broth, and a little vinegar, salt and pepper. 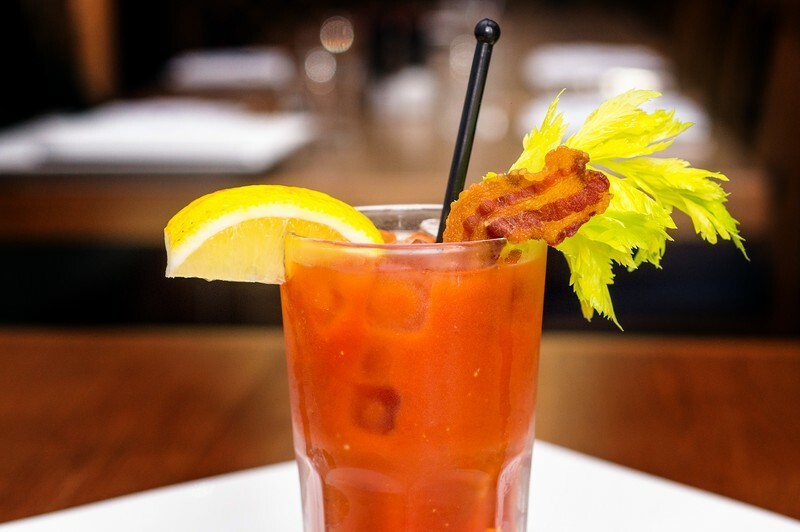 The mild flavor of the seafood is accented by advocaat, a traditional Dutch, almost custard-like concoction of egg yolks, brandy and vodka. The sweetness is provided by a creamy potato salad and sugary sundried tomatoes with the acid coming from a simple green salad in balsamic for a creatively balanced dish. 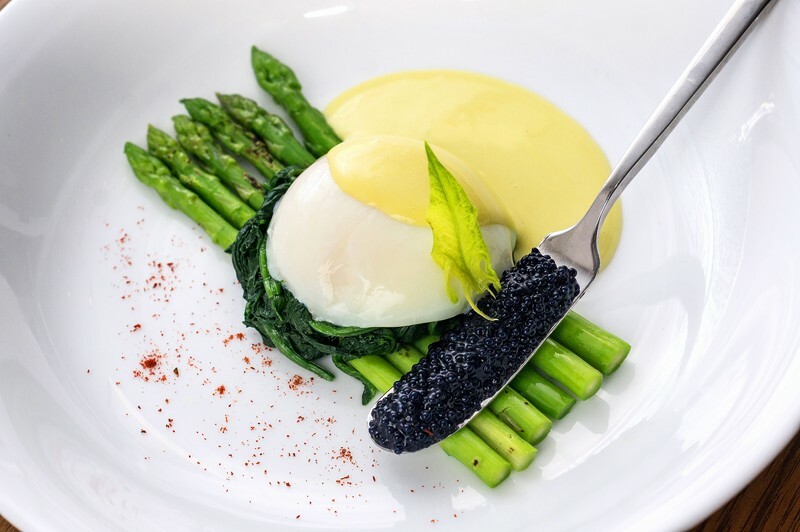 Our second starter was Steve’s Sous-Vide Egg (VND80,000), a deliciously unpretentious combination of rather pretentious ingredients: an egg cooked sous-vide for 13 minutes so the yolk oozes out over a bed of spinach and baby asparagus with a side of Hollandaise sauce and local lumpfish caviar for a burst of salty decadence. The Meatworks Butchery (VND300,000) allowed the ingredients to sing: Australian Oyster Blade steak with a beautiful sear simply adorned with toasted garlic chips, a stack of grilled vegetables and a spicy grilled corn salsa, the very incarnation of summer on a plate. 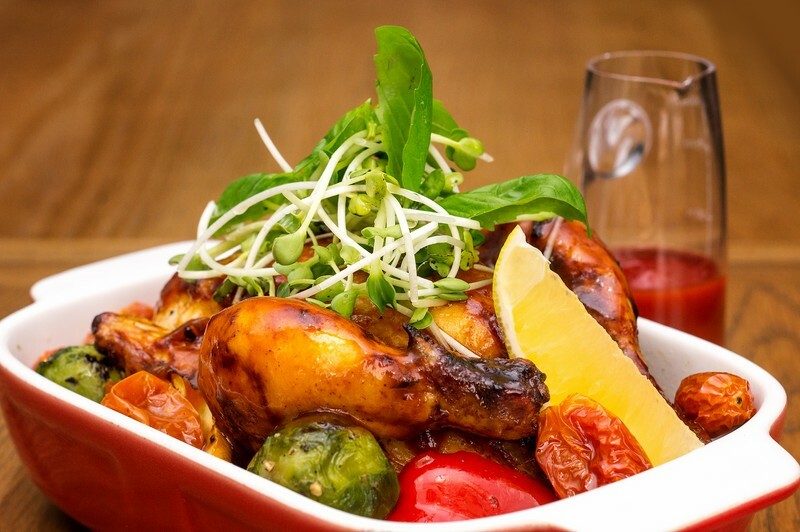 The Whole Corn-fed Roasted Young Chicken (VND360,000) recalled a perfect Sunday afternoon roast in miniature ― a succulent bird in a sweet tomato-based BBQ sauce over a bed of roasted autumn vegetables. The sides were only VND60,000, but we limited ourselves to the Pesto Pasta, a warm, comforting bowl of basily goodness. Service was some of the best we’ve encountered anywhere in Saigon, waitstaff discreetly asking whether they could clear the last course and if we wanted dessert served immediately or after a short wait. 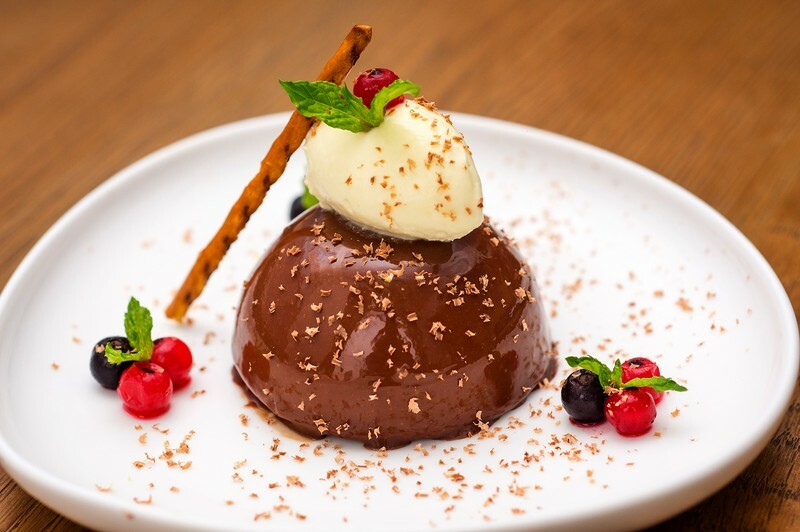 We opted to allow our food to settle before digging into a rapturous Marou Mousse (VND150,000), impossibly smooth yet firm on a chocolate and almond cookie base with a dollop of whipped cream and tart berries to cut through the richness, a dessert you’ll want to leave room for at all costs. 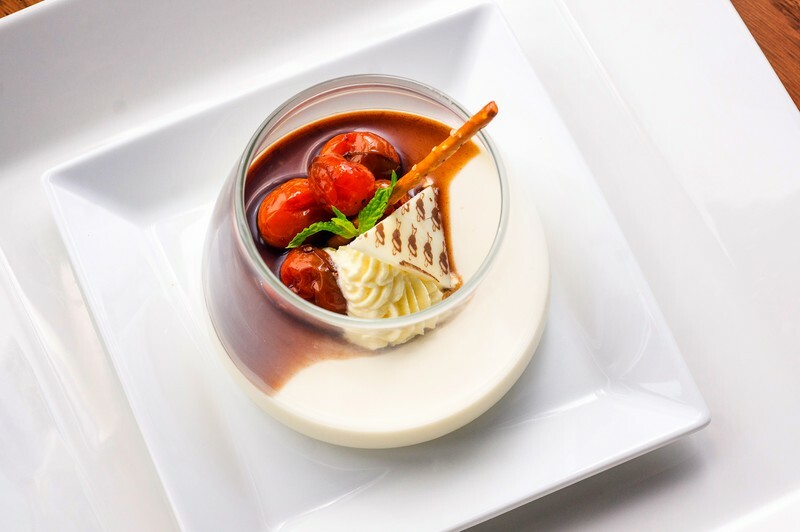 The Coconut Pannacotta (VND80,000) was expectedly light but paired with savory-sour Balsamic cherry tomatoes for a pleasant twist on the original. Café-Restaurant HCMC is open every day during Tet.